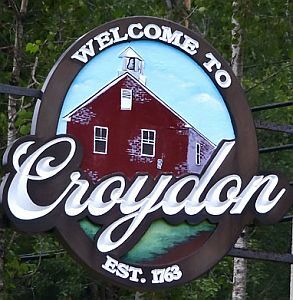 Croydon NH – Croydon voters chose to contract services from the Newport Police Department over their own Police Chief at their town meeting on Saturday. The vote would in effect terminate long time Police Chief Richard Lee’s employment with the town after 19 years of service. The vote confused some voters since this option was not on a warrant article. Croydon Select Board Chair Carol Marsh presented the option under Warrant Article Two in the police budget. A proposal of what Newport could offer vs. Croydon was displayed at the Coniston Store, as well as posted on the Croydon Community Facebook on March 14th , but no posting at the Town Hall. Copies were handed out at Saturday’s meeting, but few people had the proposal prior to Saturday’s meeting. In a paper vote, residents voted 48 – 36 to contract with Newport. The proposal is not a done deal since it will need to go before the Newport voters for their approval. If Newport voters veto the proposal, there is no Plan B at this time. If passed the target date will be July 1, 2019 for the change to go into place. Police Chief Richard Lee said he feels the voters did not have enough time to get all the information, citing public hearings on ATV use in Croydon that went on for two years. That was verified by several town’s people on the Croydon Community Page who said they were uncertain of the vote. Lee said if the majority of people preferred utilizing Newport’s services over those of the Croydon Police Chief, it was acceptable, but he wants them to be informed and feels the town people need more time and information. Newport Fire-EMS as well as Newport Dispatch will also be providing services to Croydon who currently uses New London Ambulance and New London Dispatch. This entry was posted in Uncategorized on March 17, 2019 by GrowingInArt. I’m thinking Chairperson Carol Marsh was running a slippery move. Not much integrity on that board of selectmen. Croydon may be in for a big surprise when Newport voters turn them down. The select board was asked by residents to collect data to compare our different options for policing. They did and presented it to the people, the people voted. This article sounds a bit biased in my option. I have lived in croydon for 21 year’s. I’ve seen just about everything good bad and in the middle. I’m not the biggest fan of some of the neighboring towns Newport being one of them. but I do love our small little town. I went to Newport high school and I must say that I was not to impressed with the schools resource officer’s and what was going on between the young girls and the male cops. Let alone the other stories that can be googled about Newport police over the year’s. Now before I get to far ahead their where a hand full that were good cop’s. I have never been issued any tickets from them but almost every encounter was not pleasant. So no I would not like to have a bunch of disrespectful young wanna be cops in our town. They could learn a few things from the state police. Not one bad or unpleasant experience with our state police. And you don’t feel like there not just out to get you every time you drive or walk past them. So to talk about Richard Lee. You know he was the only police officer who could figure anything out when it came to people breaking the law. I know because I was one of them about ten years ago. And its really not his fault that they don’t want to give him enough hours to do his job. And his pay is a insult compared to neighboring towns. So I get it their is always going to not like the local police officer. So wow. This was really hard to figure out. Kinda sesled my brain I had to think so long to think of this. Why not just heir a new croydon officer. This is the last comment if the town’s people let Newport in croydon they will regret it. Those hand outs were unmarked and contained false information I would never rely on information that was not on town letterhead and signed by a town official. I could have just as easily made up those comparison sheets. This town is being run into the ground by an aggressive good ole boys club, who are not above using violence and unlawful means to get their way. You reporters need to dig little deeper.